This is the first game in the Gran Turismo series. For other games in the series see the Gran Turismo category. Gran Turismo (commonly abbreviated to GT or GT1) is a racing game designed by Kazunori Yamauchi. 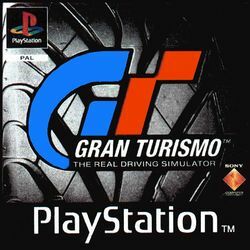 Gran Turismo was developed by Polyphony Digital and first published by Sony Computer Entertainment in 1997 for the PlayStation video game console. It was well-received publicly and critically, shipping a total of 10.85 million copies worldwide and scoring an average of 95% in GameRankings' aggregate. The game has started a series, and to date has spawned over 10 spin-offs and sequels. The player must maneuver an automobile to compete against artificially intelligent drivers on various race tracks. The game uses two different modes: arcade and simulation. In the arcade mode, the player can freely choose the courses and vehicles they wish to use. Winning races unlocks additional cars and courses. However, simulation mode requires the player to earn different levels of driver's licenses in order to qualify for events, and earn credits (money), trophies and prize cars by winning race championships. Gran Turismo features 178 cars and 11 race tracks. This page was last edited on 1 August 2011, at 11:51.